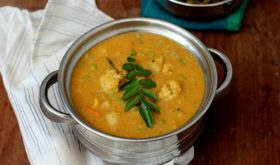 Kootu, a traditional South Indian style thick stew, is an aromatic savory amalgamation of vegetables and dal flavored with a spice base that usually includes black pepper and coconut. 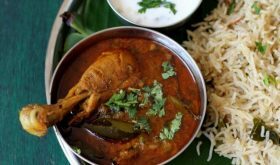 There are many variations to the kootu masala based on the region it is prepared. Wash tur dal, add 1 1/2 cups of water and pressure cook the dal till soft and set aside. In a heavy bottomed vessel, dry roast all the ingredients (except coconut) called for kootu masala on low flame for 6-7 mts or till you get a nice aroma. Add grated coconut and roast for 3 mts and turn off flame. Cool and grind to a fine powder. Set aside. Heat oil in the vessel, add mustard seeds and allow to splutter. Add curry leaves and asafoetida and saute for a few secs. Add the chopped onions and saute for 4 mts. Add turmeric powder and the chopped mixed vegetables and saute for 7-8 mts on low medium flame. Add the ground masala powder and mix well. Add tomatoes and saute for 4 to 5 mts. Add the cooked tur dal and green peas along with a cup of water and salt. Bring to a boil and simmer with lid for 8-10 mts or till the vegetables are three fourth cooked. 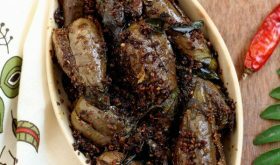 Add the tamarind extract along with a cup of water and cook on low-medium flame with lid for another 10-12 mts or till the rawness of tamarind disappears and the vegetables are fully cooked. Turn off flame and remove to a serving bowl. 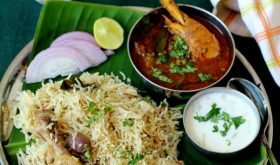 Serve warm with rice and papad. When the tur dal is cooking, do the preparation work. Prepare the masala, chop the vegetables and extract the tamarind juice. If you do not have fresh coconut, use dry unsweetened coconut powder. 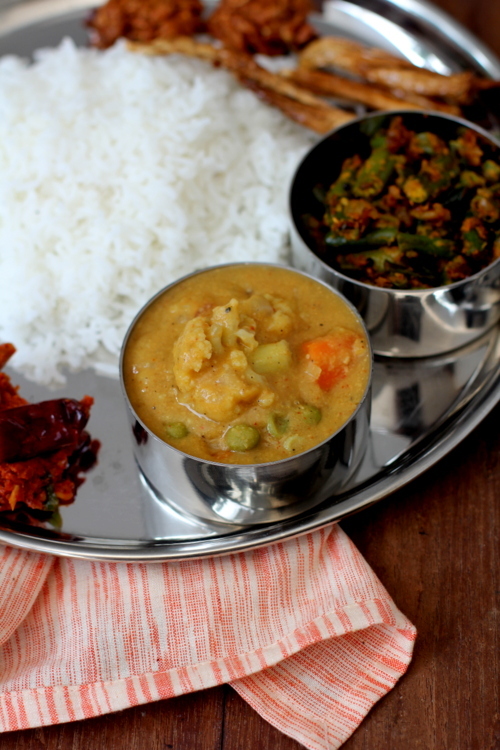 You can use a mixture of 2 to 3 dals like yellow moong and channa dal along with tur dal. Whatever dals you choose to use, see that it amounts to 1/2 cup of uncooked dal. 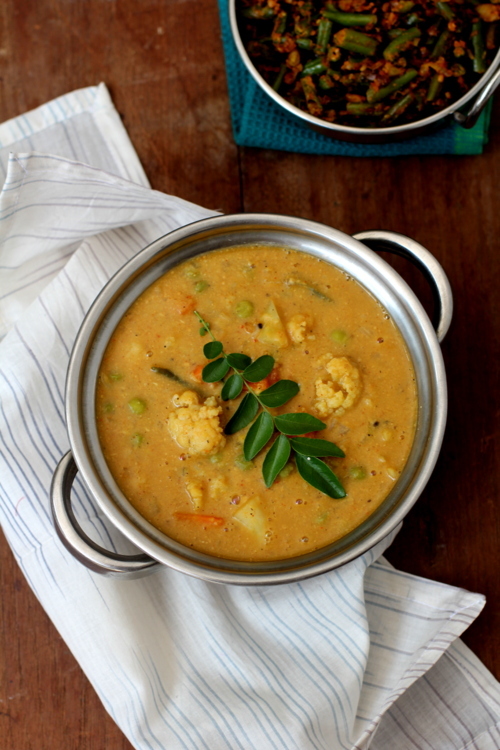 By Sailu Published: March 12, 2014 Cauliflower Kootu, an aromatic vegan curry among South Indian recipes, goes well with rice, pulao or rotis. You can add mixed vegetables to boost nutrition. Your blog was one of the very few I knew about much before I started blogging. Have tried a coule of your recipes and have liked them 🙂 This one looks like a winner too! Can u please try to add “print this recipe” option. I have tried this recipe and it was superb. Thank you for posting such tasty recipes. Very nicely explained. Great for novice chefs like me…thanks. 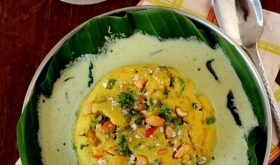 I’m looking for the recipe for beans velluli karam, Have you posted it? This is my “go to” dish for cauliflower. 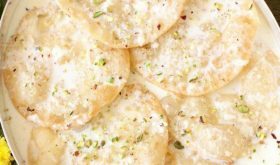 Everyone loves it, it’s rich and tasty, so great with a nice chapati or naan. It’s hard for me to make anything else with my cauliflower other than this dish. Very well done, thank you for sharing! !